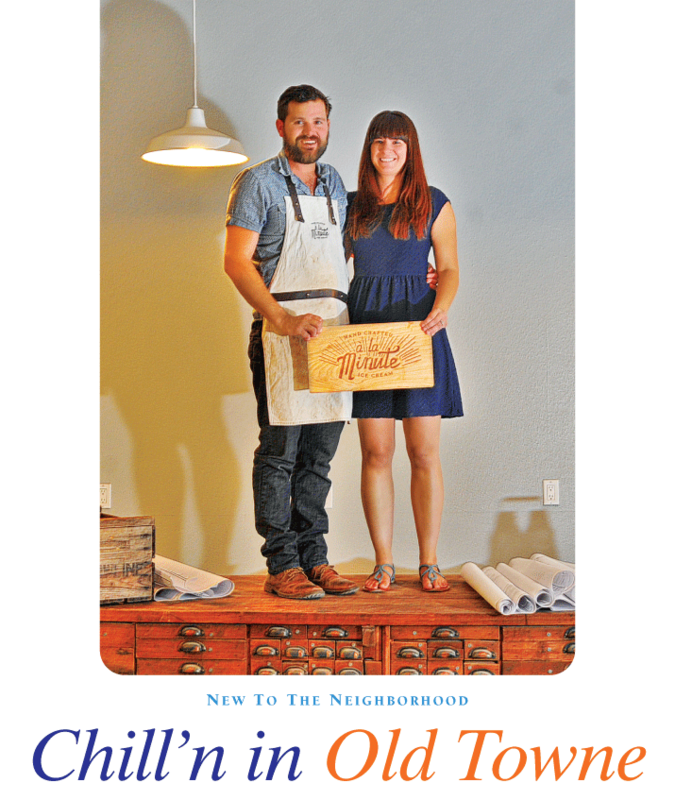 Ryan and Cassi Berk stand atop an antique cabinet featured in their soon- to-be-opened ice creamery, à la Minute Ice Cream, on South Glassell. Utilizing fresh local ingredients, the creamy, silky ice cream is made to order for each customer in less than a minute. Where can you get handcrafted ice cream that’s made right before your very eyes in less than a minute? At à la Minute Ice Cream in Old Towne, that’s where! In bringing their “instant” ice cream concept to 117 North Glassell this May, owner Ryan Berk and his wife Cassi have successfully added a second location to their Redlands-based ice creamery, which takes its name after a French term meaning “made to order.” Featuring fresh local produce in the recipes, à la Minute uses liquid nitrogen to freeze very small batches of made-to-order ice cream for each customer. Unique gourmet flavors include Strawberry Balsamic, Orange Honey, Salted Caramel and Caramelized Bell Pepper Coconut. There’s even beer-infused ice cream made with craft beer from local breweries. The idea is to incorporate as many locally sourced products as possible, says Ryan. In addition to ice cream, the couple has recently launched their own Parliament Chocolate Company, featuring handmade chocolate made from imported cacao. Ryan, who attended culinary school at Le Cordon Bleu in Hollywood, travels four times a year to Central and South America to obtain the cacao directly from local farmers. Now that he’s in Old Towne, Ryan appreciates the chance to collaborate with local chefs for his ice cream recipes and to be part of a community he admires.